The annual James Dyson Award is a platform for science and engineering students around the UK to submit designs for new inventions that will help solve a problem somewhere in the world. This year's award began collecting entries in March and now only has two days remaining for submissions. The grand prize has been upped to £30,000 and the event's organisers are urging any holdouts to get their designs in. "The award rewards those who have the persistence and tenacity to develop their ideas – it is an exciting but challenging process. Often the simplest ideas have the biggest impact," said James Dyson. Running in 17 other countries besides the UK, the award has already had a number of interesting submissions. 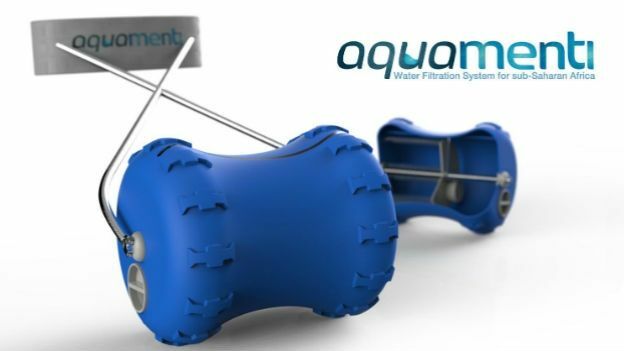 One of them - Aquamenti - is a water purification and transport device designed by Emily Bilbie, a student at Loughborough university. Aimed at tackling the issues of safe drinking water in sub-Saharan Africa, the Aquamenti is filled with water and pulled along with a harness. The kinetic energy then turns a rotating drum that pushes the water through a purification filter. Entrants can submit footage and sketches of their ideas on the award's website and the national finalists will be announced in September. The overall winner will be revealed in November and, along with the individual £30,000 prize money to develop their idea, the winner's university department will also receive £10,000. More information about the competition can be found here at the James Dyson Award homepage.